Bayholme Holidays offers an immaculately presented holiday bungalow with beautiful views over Oxwich Bay and the slopes of Cefn Bryn, only 10 minutes’ walk from Oxwich beach. It sleeps 3 adults (or 2 adults + 2 children) and is strictly no smoking or pets. The bungalow offers a very high standard of cleanliness and comfort and is able to accommodate up to three people in two bedrooms; a master room with a double bed and a single room. An extra child could be accommodated by way of a temporary bed in the single room. 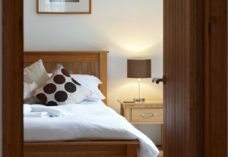 There is plenty of storage for clothes in the bedrooms and blankets are provided, but guests should bring their own sheets, towels and tea-towels. The bedrooms lead onto the bathroom which has a bath, hand basin, toilet and electric shaver point. The bungalow is very well designed, maximising the use of space. The open-plan kitchen/living area is light and airy and is fully furnished with lounge and dining facilities which include a television, DVD player and an electric fire. The fitted kitchen is complete with fridge, freezer, an electric cooker with extractor hood, toaster, kettle, microwave, plenty of cupboard space and all the cutlery, crockery and kitchen utensils that you might expect. Externally, there is a table and four chairs – perfect for dining outside or just sitting and admiring the view. The patio is completely enclosed, so no worries about a little one running off. Electricity is supplied via a £1.00 coin meter. The bungalow is under the personal supervision of the owner and there is a good discount for two persons, but we regret that no pets are allowed and that any visitors are strictly by appointment only. We have had bungalows in Oxwich for many years and we can help you with all your enquiries at all times. Have special requirements? Call Yvonne Crombie on 07770 686210. Good discounts for two adults.